One benefit of making sweets for family and friends is that I get to experiment with new flavor combinations. My mother's birthday was last week, and I was excited to try something a bit different. Year to year, I always try to one-up myself with unique flavors, creative designs, and new pastry techniques. This year, my mom requested pistachio cake. But, after making a giant pavlova for my brother's girlfriend's birthday a couple weeks ago, I remember her saying she loved meringue too. So, my plan was to somehow incorporate baked meringues and cake in one. The result? Well, you can see here in the pics. 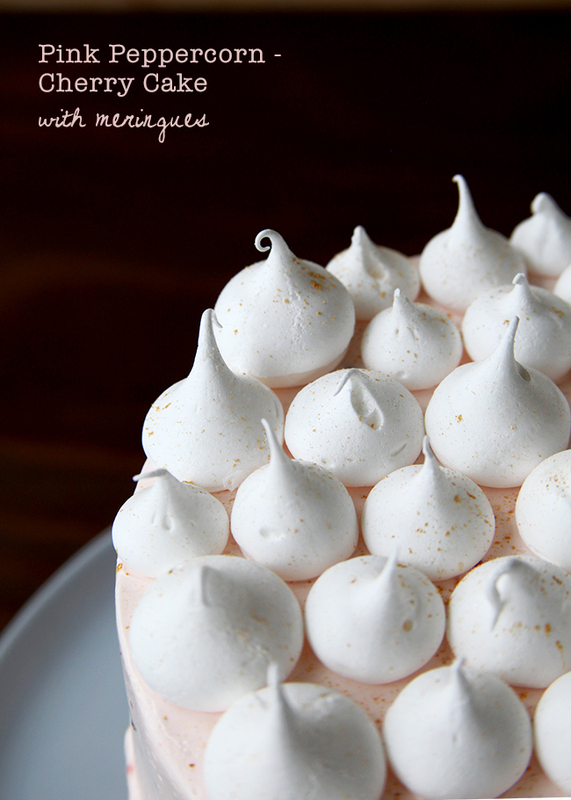 Cake decorated with baked Meringue Kisses! Of course not everything went to plan. When does it ever really? Come birthday week, I could not find pistachio paste need for the recipe anywhere! The afternoon before my mother's birthday I found myself at the last sure place to find the ingredients I needed, only to find that they were sold out. So here I was stranded without a plan B- at least I was at Gourmet Warehouse. This year's "new recipe + unique flavor pairing" challenge was sure taken up a notch. I was surrounded by almost every spice, herb, type of chocolate, jam, tea, etc you could think of. I pretty much had too many options and no time to brainstorm. I quickly started heading down each aisle, picking up flavors I knew my mom liked. Finally, I had to stop, rack my brain a bit, and try to remember some of the recipes on my "to bake" list. PINK PEPPERCORN! Yes, I know that is something I always wanted to work with. And mom loves interesting flavors. And what goes with pink peppercorn? Well, I don't know.... But I know strawberries go well with black pepper, so I figure any red fruit would probably do. The final result? Pink Peppercorn and Cherry Cake. "Yes! This will totally work," I thought. I grabbed some Cherry Jam and the almond extract I needed and ran home to make the cake. This cake ended up being delicious, unexpected, and pretty darn cute- if you ask me. Layers of almond cake were topped with spicy-sweet pink peppercorn buttercream and cherry jam. The whole cake with iced in the beautiful pink buttercream speckled with crushed peppers. I used a Swiss meringue buttercream base and the pink peppercorn paired beautifully. The buttercream is slightly sweet and buttery, and the spicy-sweet crushed peppers added a level of flavorful that was unexpected and unique. You may adjust the amount of peppers to your liking. And paired with sweet, tangy cherry filling? Perfection!! Last but not least, the meringue kisses acted as whimsical cake toppers- dusted with a bit of gold luster for added prettiness. Using 3 butter cake rounds, layer with buttercream and a thin layer of cherry jam. As mentioned, I used store-bought cherry jam. Use the buttercream to create a damn first before filling in with cherry jam to prevent it from leaking. For further instruction on how to layer and ice a cake, go here!